LONDON — British lawmakers on Wednesday overwhelmingly backed Prime Minister Theresa May’s call for a snap election, paving the way for a June vote she hopes will give her a "mandate to complete Brexit". 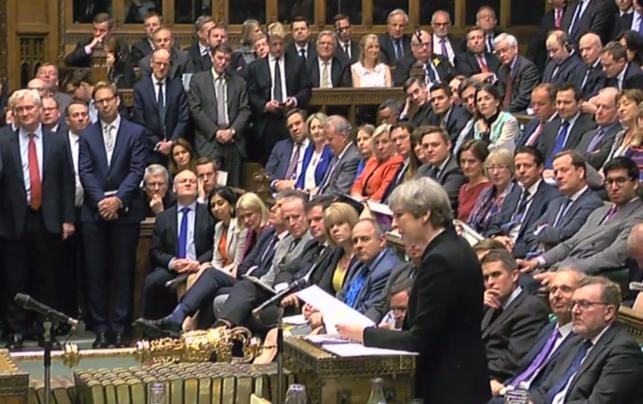 The House of Commons voted by 522 to 13 to hold a general election on June 8 -- plunging Britain back into political uncertainty just weeks before the start of negotiations on leaving the European Union. Addressing MPs beforehand, May said an early vote would strengthen her hand in dealing both with Brussels and domestic critics seeking to "frustrate the process" of Brexit. "I will be asking the British people for a mandate to complete Brexit and to make a success of it," the Conservative leader said, to cheers from her lawmakers sitting behind her. May stunned the country on Tuesday when she announced her plan for an early vote, despite having repeatedly said she would wait until the next election scheduled in 2020. Riding high in the opinion polls, May is seeking to increase her slim majority of 17 in the 650-seat Commons before the battles begin with the EU over Britain’s exit bill and future trade and immigration ties. In a taster of the campaign ahead, May traded barbs in the Commons with opposition Labour leader Jeremy Corbyn -- most likely for one of the last times before the election, after the prime minister ruled out attending any television debates. May hit back that Labour offered only "bankruptcy and chaos", but denied she was complacent, saying: "We will be out there fighting for every vote." British elections are fixed in law but can be changed with a two-thirds majority in the Commons -- a threshold easily passed during Wednesday’s vote. Parliament will still sit for another fortnight, but party leaders wasted no time in hitting the campaign trail on Wednesday evening. At a rally in south London, Corbyn pledged to fight for social justice in the Brexit talks and promised more investment in public services. May meanwhile headed to the northern English town of Bolton to promise "the strong and stable leadership this country needs to take Britain through Brexit and beyond". The prime minister, who took office after David Cameron resigned following the EU vote, is seeking a personal mandate for her plan to pull Britain out of Europe’s single market. Three weekend opinion polls put the Conservatives about 20 points ahead of Labour, while Britain second female prime minister also has strong personal support. By contrast, Labour has struggled to form a strategy over Brexit, while Corbyn’s left-wing leadership is opposed by many of his more centrist MPs. Labour supported the start of the formal Brexit process last month, but has demanded certain conditions, such as retaining strong economic ties with the bloc.